An e-book reader is a portable electronic device that is designed primarily for the purpose of reading e-books and periodicals. E-book readers are similar in form to a tablet computer and usually refer to readers that use electronic paper, which means better readability of their screens especially in bright sunlight, and longer battery life. When disconnected from the web, an e-book reader’s battery will last from weeks to months. A tablet computer typically has a faster screen capable of higher refresh rates which makes them more suitable for interaction. Any device that can display text on a screen can act as an e-book reader, but without the advantages of the e-paper technology. An ebook reader is designed specifically for reading ebooks and not a great deal else. However, you can also read ebooks on a tablet computer, which will let you play games, browse the internet and send emails. Matte e-ink display designed to be easy on the eye for reading with little glare from reflected light. Black and white screens rather than full color. 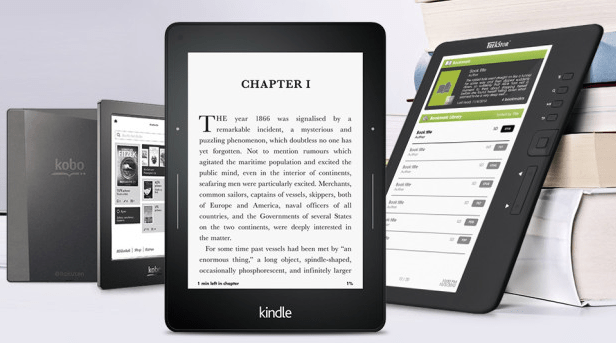 E-book readers are portable devices, usually with energy-frugal black-and-white display screens optimized to show the electronic text of digital books. These electronic book readers typically have screens that are 6 inches in size–and thus larger than smart cell phones and smaller than most tablet computers. Almost all the e-book readers support HTML, Txt, MP3, and JPG. The battle of formats in the world of e-books is largely between the proprietary format that Amazon uses called .azw, a flavor of Mobipocket, and the open source ePub. Amazon’s Kindle does not support ePub; almost all other e-book readers do. .epub is a free and open e-book standard used by most e-book readers. .azw is Amazon’s proprietary e-book file format for the Kindle. Most e-book manufacturers have their own e-books store. And size matters here. The more publishers the manufacturers can ink deals with, the greater the chances that the book you want is available. That’s where Amazon’s Kindle stores. As the biggest online retailer of books, Amazon has been able to leverage that relationship for the Kindle and its e-book store is probably the largest, with more than 285,000 books, according to Amazon. But Sony is fast catching up. It announced a partnership with Google to bring about half-million classic books to its digital bookstore. Sony Readers can get those books for free. Sony had about 100,000 titles in its e-book store at the end of 2008. Other e-book readers such as the iRex iLiad or the Hanlin eReader don’t have that kind of muscle and though these e-book owners can buy books from other online bookstores, it doesn’t offer a smooth, integrated experience. Think to buy music through iTunes for the iPod vs. buying music on iTunes for the SanDisk music player. Manufacturers are also improving the quality of these E Ink displays. A few years ago, page refreshes were sluggish, the entire screen flashed black with each page turn, and some early ebook readers had problems with text contrast, which made for difficult reading. Most devices now offer Wi-Fi as the base level wireless connection—at a much lower cost—with 3G cellular data only available as part of a more-expensive Kindle Paperwhite version. These devices, including Amazon Kindles and Barnes & Noble Nooks, focus primarily on displaying e-books and are all we include in our Ratings. Many also offer newspaper and magazine subscriptions as secondary capabilities that are compromised somewhat by their monochromatic screens. Many have black-and-white E Ink screens, and so offer decent or better type and long battery life, while others have LCD screens, with shorter battery life and less crisp type but the ability to reproduce color. Amazon also makes tablets: the Kindle Fire HD and the Kindle Fire HDX, which are Wi-Fi only and/or Wi-Fi and 4G LCD color devices for music, books, movies, games, and more, and come in a choice of two screen sizes and more (see tablets). Barnes & Noble’s e-book reader, the Nook, the bookseller’s first electronics device, entered the market in December 2009. Barnes & Noble offers an e-ink Wi-Fi-only version of the Nook, with a light, and two LCD Wi-Fi color devices with different screen sizes (see tablets) that come with software to read books to kids, play games, read e-mail, and more. A Canadian company that makes a range of e-ink devices that connect to its own e-bookstore, Kobobooks.com. Kobo has also introduced LCD Wi-Fi only tablets for books, social reading, music, movies, and more. When Sony departed from the digital book segment in early 2014, Kobo took over Sony e-reader customers, who continue to have access to their full library using Kobobooks.com. A company is known mostly for its electronic dictionaries and language learning products, Ectaco was among the first of many companies to enter the e-book reader market. It produces a line of jetBook e-book readers and introduced the first color e-ink reader, designed primarily for use in schools.